A member of The Daughters of Dorcas and Sons works on her quilt. The first in a series of collections-focused exhibitions, Home Sewn features quilts created by Annie Dennis (1904­­–1997) and Emma Russell (1909–2004). Quilts represent classic American quilt patterns and techniques passed down through five generations. This exhibition examine the generational, social, and economic fabric of an African American quilting community in rural Mississippi. 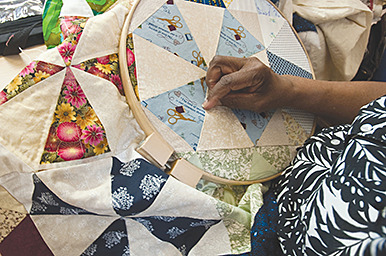 In addition, fieldwork and interviews with present-day African American women quilters give voice to the continuing tradition of quilting in these communities.